Have you ever accidentally mistyped one word for a similarly spelled word when drafting a patent application, but the Word’s spellchecker didn’t catch the error? This will often happen when the word itself is spelled correctly, but is the wrong word for the context, such as nodule vs. module, formed vs. foamed, post vs. host, etc. If the error is not caught before the patent issues, it will not only embarrass the attorney, but could also affect the validity of the patent, especially if the typo appears in claims and changes the meaning of the surrounding limitation. The fact that these typos made it into the issued patent obviously does not great look for all of the involved parties. The misspelled ‘means’ is unlikely to become a real issue during enforcement proceedings because the intended meaning of the misspelled term is quite apparent in the context of the claim. That said, “Bald label” is somewhat more ambiguous, so if there were several similarly spelled terms with different meanings used in the claims, the ambiguity could become significant enough to render the claim scope indefinite. Because spell-checkers do not work for these issues, the only way to find such mistakes is carefully proofread the document. ClaimMaster makes this patent proofreading a little bit easier with “Find Similarly Spelled Words” feature. How Does ClaimMaster Help You Identify Similarly Spelled Words? To catch the tricky similarly-spelled errors, ClaimMaster scans the document for words that (1) appear infrequently in the document an (2) do not vary significantly from a similar words appearing much more frequently. For example, if you continuously refer to “control module” throughout your patent application, but in one sentence you accidentally mistype the term as “control nodule,” ClaimMaster will flag this as a possible error. 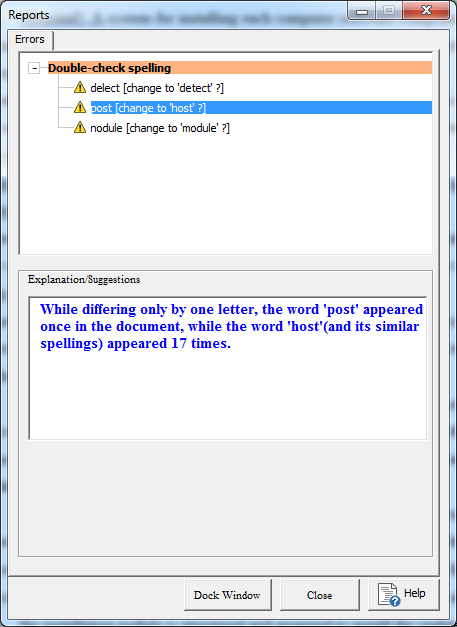 You’ll be shown the problematic word, along with the term that we think you intended to use (i.e., “nodule” appears only once, while “module” appears 17 times in the specification). Therefore, don’t always rust your spell checker (err…, we mean trust)! If you want to ensure that your application doesn’t have any typos, make sure to run it through both the Word’s spell-checker and our “Find Similarly Spelled Words” check.